12/2014 update: There’s a new ecobee model in town and it’s fantastic. However, we still think the the EB-STAT-02 deserves a 4-star rating. The only thing “wrong” with it is the dated touch screen design, but it’s still got all the stuff we love: data reports, remote access, and simplicity of use. 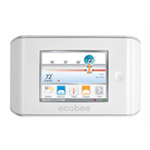 The EB-STAT-02 is like a programmable thermostat on steroids. No gimmicks, no extras, just a great thermostat. 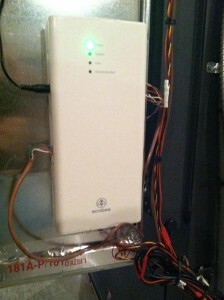 The ecobee EB-STAT-02’s thermostat unit. Founded in 2007, Toronto-based ecobee, Inc. aims to bring smart, easy, and green products to consumers. Ecobee launched the world’s first Wi-Fi enabled thermostat in 2009, winning numerous awards and establishing a brand new category of consumer products – the smart thermostat! Of course, now it’s 2014 and competitors have introduced their own Wi-Fi enabled thermostats. The ecobee EB-STAT-02 is starting to show its age – the form factor isn’t as stylish as the Nest’s and the touch screen feels dated thanks to its resistive design (as opposed to capacitive, which is what you’re familiar with if you’ve used a modern smartphone or tablet). However, ecobee remains a data-cruncher’s dream. The device collects and reports nuanced data about your home’s energy usage. For pragmatic users eager to slash their energy bills, the ecobee is a strong choice, and the user-friendly screen layout will be greeted with enthusiasm by less technically-inclined family members. 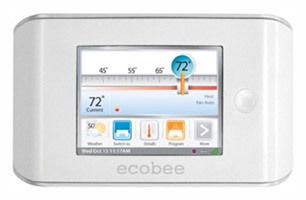 The ecobee EB-STAT-02 mobile app interface is identical to the thermostat’s interface. Less technically inclined users will love not having to learn two interfaces. The ecobee’s edge is in its usage reports. Get insights into your home’s energy usage with Home IQ’s personalized statistics. Home IQ lets you see monthly heating/cooling summaries, influencing factors such as the weather, and an estimate of your savings. For the competitive among us, the ecobee compares your system’s runtime against similar homes (sq. footage) in your state. 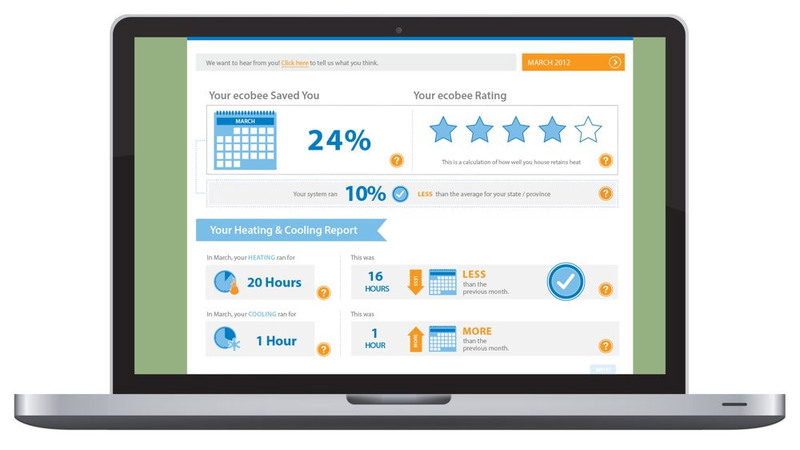 ecobee free monthly report as viewed on a computer screen. Click to enlarge. Some of ecobee’s Amazon.com reviews are from users who started with a Nest, but found it incompatible with their system so they replaced it (successfully) with an ecobee EB-STAT-02. The Ecobee EB-STAT-02’s touch screen is not as sophisticated as the Nest’s or the Honeywell Wi-Fi Smart Thermostat’s. Some users complain that it’s more like 90’s touch screens (resistive) than modern smartphone screens (capacitive), and some complain the screen is too small for their fingers. Some ecobee screen controls are sliders, and some users find it difficult to be as precise as they would like. The ecobee EB-STAT-02 ships with an equipment interface module, which is a second piece of equipment to install somewhere between the furnace and thermostat. This isn’t a problem for most, but it might be an unexpected surprise because many competitor models do not require this control panel. The panel can be positioned vertically or horizontally. Ecobee’s mobile app has garnered some negative reviews for not being as complete as the web portal. The mobile app lacks access to Home IQ (the detailed data reports), and cannot be used in portrait orientation (only landscape). 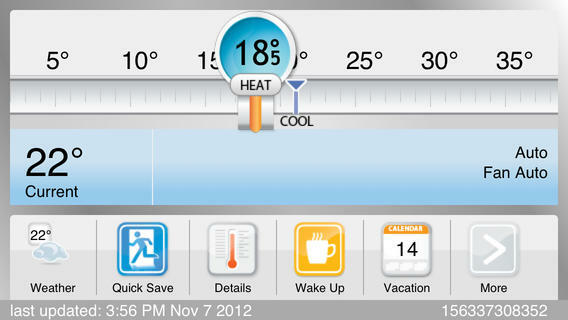 Ecobee’s app is limited in function: it can only adjust the temperature, mode, and programs. The Ecobee EB-STAT-02 is a data crunching techie’s dream but it lags behind the competition on user interface design, screen usability (users complain of small size and awkward sliders), and installation. Professional installation is recommended, and a relatively large panel component has to go somewhere between your furnace and thermostat. The mobile app doesn’t offer full access to the Home IQ data, which is a shame because Home IQ is the Ecobee’s best selling point. Data-hungry users will have to use the web portal instead. Still, most buyers give their Ecobee a high rating because of Home IQ, which goes above and beyond the competition’s usage reports. Users also report good compatibility with their HVAC systems compared to the Nest. Many Ecobee reviews on Amazon.com are from consumers who had trouble with Nest before switching (happily) to an Ecobee.